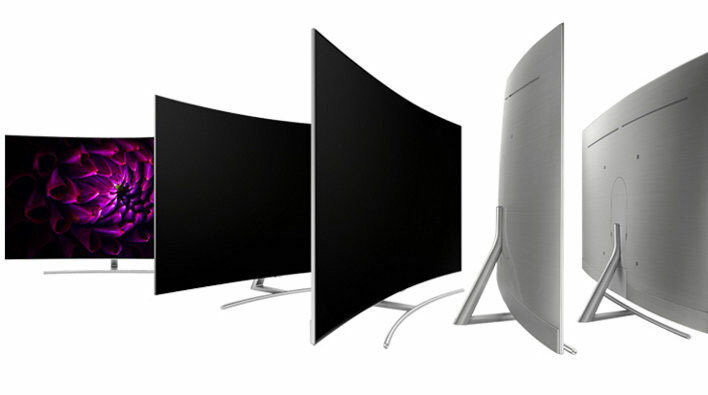 While OLED has been out for a few years now it is still one of the most expensive pieces of technology for television. 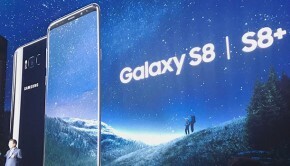 It was only a matter of time before something new would try and rival it and Samsung looks to have the answer for OLED. They’ve come out with a line of QLED (Quantum Dot) TV’s that bring out the best of what an OLED TV but in a familiar shell. This TV is one of the best designed TV’s out there. The Q8C has a curved bezel-less screen and a chrome trim that’s only about 5mm wide and a all-metal chrome stand with a curve shape. The Samsung logo lights up when you turn it on but can be toggled and the overall TV is thin. This is thanks the One Connect box that is the brains of the operation which connects from the TV from an thin fiber optic cable. The remote is pretty minimalist as well giving you only a few buttons to navigate but gets the job done just fine and can even accept voice commands. Design-wise this TV is definitely is a head turner. The Q8C uses a 10-bit panel that’s 4K with edge LED lighting and has new quantum dot technology over that as a new layer. This layer preserves the pure color and increases the brightness of the entire display. This also means that over 1,500 nits of peak brightness can be achieved by the TV itself. 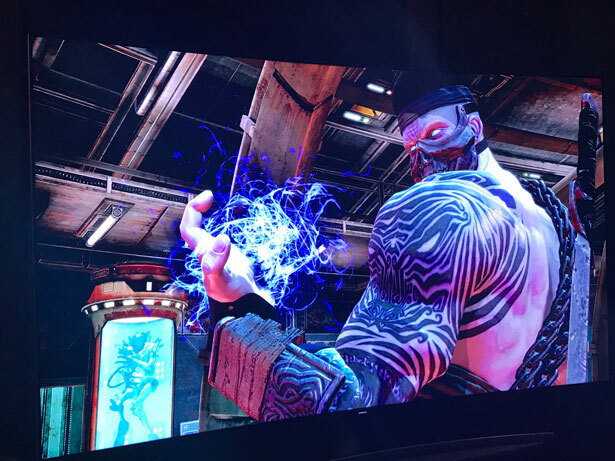 With that being said they’ve opted out of the traditional chip system and inputs directly on the TV and have instead went with a Smart Hub call the One Connect. This actually acts more like a mini receiver then just a hub for the TV as it has multiple HDMI connections, internet, optical port, antenna and three USB ports. Only issue we had here like the TV itself it doesn’t have any real physical buttons to turn on the TV and navigate which means the remote is everything so you can’t lose or misplace the thing. 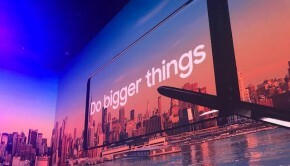 The One Connect has a launch bar at boot up which lists your apps and various smart device features. 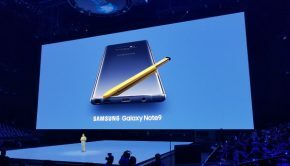 It runs on a Tizen platform which performs very smooth. The TV supports HDR10+ (The plus is a slightly more customized version of High Dynamic Range 10) and HLG which make the picture color range great A great feature is how new devices are added, connecting a game unit like an Xbox One or PS4 gets an automatic prompt and add to the overall hub like an app newly installed. Other devices can be added manually as well which is a simply process. The menus are fairly easy to navigate giving you plenty of options for sound, picture and other settings. I also particularly liked the fact that Gamefly’s streaming service is also a feature in the box as well. You can grab a blu-tooth controller and play games if you have a subscription to the service. The only real hiccup we’ve run into is the screen locking up for as long as 30seconds when you boot it up with a specific program already launched like Netflix. Another which is not really an issue per say as you have to make sure that if you want to receive a 4K signal that you go into the menu settings and under the specific HDMI port you are using that you select it. It doesn’t do it automatically but I hope in the future it does. The TV has a ton of settings that could be taken advantage of once you get it up and running. Out of the box the picture quality is good. Set on dynamic with flesh tones on the warmer side. 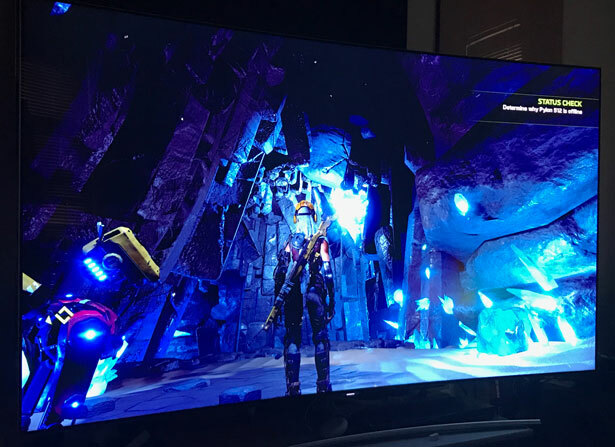 Calibrating the TV opens you up to achieve great brightness levels, local dimming on and off and a better contrast ratio which we took full advantage of. Black levels were also great on this and of course with a darker room performed even better. Depending on your local dimming setting makes a difference in contrast and black levels. Our 4K test for streaming worked well. Netflix’s 4K offering and HDR is some of the best you can stream anywhere. Masters of None Season 2’s colors really pop and facial detail looked very good as well. Batman V Superman in 4K UHD Blu-ray also looked exceptionally well. The range of color in that movie is one of the best we’ve seen for HDR. Last but not least for gaming we tried a few games for Playstation 4 Pro on scaling 4K and Injustice 2 and Forza Horizon 3 with HDR. Gaming was the cream of the crop, color accuracy across the board was like nothing I’ve seen before, the level of detail was outstanding and the low latency is how gaming should be done! The sound for this specific TV was pretty good for how thin it is. It has a 60W of amplification built into a 4.2-channel and is evened out on the display. It can get pretty loud without getting muddy so their’s no need to worry about the actual sound quality here. 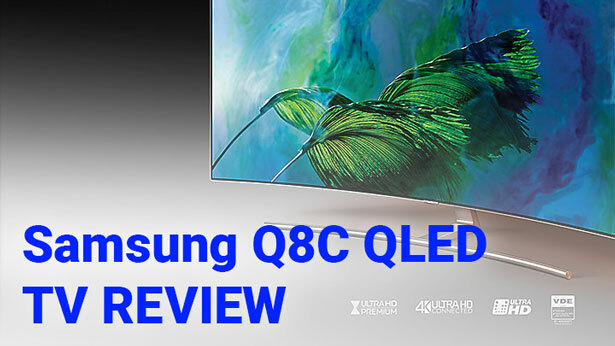 The Q8C is one of the best TV’s we’ve seen to release. 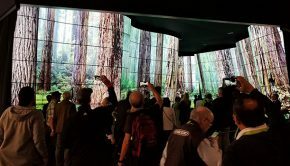 OLED is superior in some functionalities but has a high price tag. The price tag for these at the moment are a bit high and it is an LCD at its core but this is a great TV with an amazing display and shows much promise for the future of Samsung in this space. This is the perfect TV to watch movies, live events and play games on as 4K along with 1080p both look great on this! Click here for our mobile video review link.